If we perceive the writer Cullen Bunn perhaps received instruction to radically change Aquaman but still tell a fairly recognizable Aquaman story, then I would say he succeeded. Aquaman Vol. 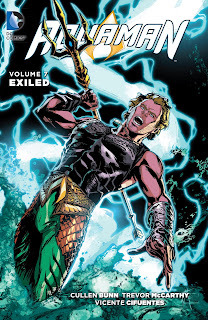 7: Exiled takes Aquaman away from most of the familiar elements that have populated the series so far (or at least, has turned them against him), but Bunn does so in a way that seems sensible and true to the Aquaman character to me. Though the dark-costumed Aquaman reads visually "gritty," it's ultimately his nobility that shines through in the story. But Bunn's story is troubled not in the least because of these very marching orders, which among other things sees Aquaman Arthur Curry given a new power set that doesn't benefit the character, even despite Bunn's good writing of Aquaman for the most part. That's a cautious "for the most part," because whereas Aquaman's actions in Exiled mostly scan, the story turns on a point of naivete that gets exceptionally problematic. At eight issues, Exiled comes off a tad long, and then for all that time it ends with an extra-sized issue that seems to rush the ending. I don't tend to be enthusiastic about series artist Trevor McCarthy and in all there's twelve artists in the book, such that the visuals didn't grab me either. All of this makes for a valiant effort, but it was clear to me by the end why Aquaman's "DC You" new direction needed a Rebirth. Again, there's a quite lovely premise at the center of Exiled, that an evil dimension of sorcerers is invading our own, but that Aquaman refuses to vanquish it until he can get the innocent people of the dimension out of harm's way. If we consider that the root of modern Aquaman stories has been the relationship between a king and his subjects, it's a smart turn by Bunn to put Aquaman in a position where he has to consider the needs of other peoples before his own, and even smarter that by default Aquaman chooses to do the magnanimous thing here. Though I can't imagine a writer giving Arthur a different choice, I felt Bunn presented Aquaman as "superhero" here more clearly than previous recent writers have done. But for one thing, Bunn gives Exiled a mystical bent that's just not my preferred take on Aquaman. I'll grant that Aquaman is an iffy prospect for me to begin with, as I'm inclined to enjoy Aquaman versus Black Manta or Ocean Master much more than Atlantean court politics or the minutia of Atlantean mysticism. Here Bunn has Aquaman imbued with mystic powers from the god Poseidon that include creating ice, calling down lightning, and teleporting. That's not so far afield necessarily -- and Bunn uses the teleporting to good effect when Arthur finds himself on an alien planet (the faintest shades of Swamp Thing #56's "My Blue Heaven" here) -- but enough so that this didn't feel like fully authentic Aquaman material to me. Admittedly some of my discomfort here is guilt by association, as this mystical Aquaman reminds of the less-well-received "Waterbearer" and Sword of Atlantis eras (not to mention that Exiled's wizard Extriax smacks of Sword's Dweller of the Depths). The titular "exile" requires that Atlantis turns against its king, which is not wholly rare or hard to imagine. Bunn has Atlantis do so, however, at the command of their stand-in monarch, Mera. Taken on its face and knowing the personas of these two characters, one would think Mera would sooner argue for saving the refugee Thulians than Arthur, and the fact that Arthur doesn't immediately suspect outside forces when Mera turns against him is a questionable choice on Bunn's part. Surely I recognize the need for drama, but that Bunn has Arthur treat Mera's strange turn almost as a relationship issue seems a juvenile approach. And Bunn buys himself a heap of unnecessary trouble in having Arthur sleep with what turns out to be a woman disguised as Mera; I rather hope this is just ignored next volume, instead of the bad options that Aquaman and Mera are just OK with it or that Mera holds a grudge against Aquaman because of it (further the woman, Siren, basically disappears in the end and there's little resolution to why she calls Mera her "sister"). Exiled ends in an extra-sized issue; Dan Abnett writes the next volume and continues on to Rebirth, so one can imagine both that end of Cullen Bunn's run perhaps came suddenly and that maybe he needed more pages to wrap it up. Unfortunately that wrap-up doesn't satisfy, as not only don't we learn about Siren but also it's never quite clear what is the much-heralded sacrifice that Aquaman supposedly makes (possibly some of the innocent Thulians die, but I thought that was an eventuality understood from the outset). Bunn also never explains where this book's cadre of Atlantean bad guys come from, not to mention once-and-future Aqualad Garth, something I wish Bunn could've found room for in the eight issues. As ultimately just a one-off story, again I felt Cullen Bunn succeeded in cutting through some of the angsty chaff of Arthur Curry in Aquaman Vol. 7: Exiled and letting his hero shine. That comes, however, under unmistakably 1990s angsty trappings, including Aquaman's darker costume. As with the "Green Lantern: Renegade" story (which I admittedly haven't read yet), some aspect of "DC You" reminds of the late 1990s post-"Death of Superman" era in which every other DC title tried to accomplish a radical deconstruction of their hero, giving us the jacketed Wonder Woman, Hal Jordan's madness, and so on. Clearly Rebirth's quick ascent bespeaks "DC You"'s mixed results, of which this Aquaman book is an example. I think the saddest part about this short run was that Bunn asked to leave the book because of the fanbase treating him so badly. Outhousers has a particularly good recap of that situation. No one deserves online abuse, up to and including even before Bunn's first Aquaman issue came out. And I don't even agree with Bunn's assessment that this wasn't the right story for Aquaman; I think it could have been, with (easy for me to say) an adjustment here and there. But even if Bunn had a long-term plan, I can't see how the Aquaman/Siren situation isn't more likely to lend itself to simplistic, maudlin angst than real, nuanced storytelling, and in that respect perhaps this was ill-conceived (and Dan Abnett's next Aquaman book is awesome, so maybe it's all for the best). There's a place in fiction to deal with what Siren assaulting Aquaman brings up, but probably DC Comics's Aquaman title is an iffy place to try to do it. I read half of this volume (issue #41-43) at a friends house and I never finished it. I wasn't a fan of the story, so reading the second half wasn't a must and then I forgot about it. I do remember thinking the book was trying to be to smart, throwing you in halfway through the story and letting you figure out the rest with flashbacks, but it just didn't read well since a lot was to predictable for that to work. The faces felt drawn a bit weird to me and there were a few moments the art felt off. On the reaction Bunn got: I don't get why people have to attack someone personally when they don't like something. It's ok to give your opinion or criticism on something, but it's not ok to act out like that.